An essential part of any home cinema setup is the screen. No matter how much you spend on a projector, if you scrimp on the screen, you’ll notice. Luckily you have three options to consider. Projector-friendly paint: you can paint a section of a wall. Our recommendation is Dulux Light & Space Matt Emulsion Paint – Absolute White, which is available from most hardware stores. You’ll need at least 2 or 3 coats to create a suitable area. However, you need a really flat wall as bumps will distort the picture and lead to a less than ideal viewing experience. Matte vinyl fabric: You can either choose from a pre-built screen or buy fabric and build a frame yourself. It’s important to choose a fabric with a low gain rating and the right viewing angle. Pull-down: Exactly like the ones you had in school! These are great if you don’t have a dedicated media room or space for a permanent screen but still want a superior viewing experience. 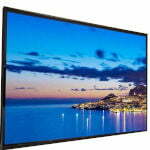 Our list focuses on pre-made fabric and pull-down 100 inch home theatre screens. We’ve rounded up a range of options for you. 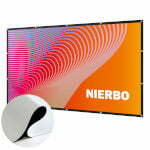 Costing £32.99 from Amazon, NIERBO 100 Inch Projector Screen is a pre-made screen, which easily attaches to frame or wall. The screen displays in a 16:9 aspect ratio and has a fairly high 1.5 gain. On first opening the package, you’ll discover NIERBO has used a new packaging method, which prevents wrinkles. NIERBO have manufactured this screen from High-quality PVC. The thick white front reflects light well. Wheres the black coloured back, stops the light being passed through. These combined means the projected image is brighter with more brilliant colours. This home theatre screen is both HD and 3D compatible, which is great if you have a Blu-ray player with 3D software. The included magic tape make it’s easy to install the screen to a wall. If you don’t mind DIY, then you can also build your own frame. Finally, this product comes with a lifetime warranty. Beware of the sticky side – it’s strong enough to remove plaster! At a penny shy of £33, the NIERBO 100 Inch Projector Screen is great value for money. We like the packaging and the warranty. NIERBO seems to offer superb support. The only downside seems to be the installation kit. Some users have reported that the velcro is quite weak and needs to be constantly adjusted. So if you do want to use velcro, buy some of better quality. If you plan to build a frame, use screws to hold the screen in place, rather than velcro. Overall the screen produces a superb image at the standard 16:9 ratio with good viewing angles. 8/10. At £10.99, the MultiWare Projector Screen 100 Inch 16:9 Cinema Projector Screen is highly affordable and available from Amazon. Manufactured from PVC, the matte white viewing surface diffuses projected light uniformly and has a gain of 1.1. It’s also easy to clean. This home theatre screen offers a viewing area of 87″ x 49″ with a 16:9 screen format. The 6 eyelet holes around the edge make it easy to attach the screen to a frame or wall. The MultiWare Projector Screen does come tightly packed, which increases the chances of creasing. So you might have to iron it flat. With such an affordable price, you might want to get a second for the garden to enjoy movies in the summer. If you’re looking for your first screen or a second one for the garden then, consider MultiWare 100 Inch Cinema Projector Screen. At £10.99 it’s very affordable. Just beware that it might come with some creases, which will take time to remove. Once you’ve ironed them out, it’s probably best to secure it to a wall. You’ll lower the chance of creating new creases. If you’re looking for a screen for your home and travel, then the OWLENZ 100 Inch Portable Projection Screen is a fantastic option. Available from Amazon for £19.99, it’s also very affordable. The natural polyester fabric doesn’t easily wrinkle or crease. And as you can easily fold the screen for storage or travel, the OWLENZ could be the perfect solution. The matte white surface is twice the thickness of other screens and has a gain of 1.1. Images, therefore, appear sharper and brighter regardless of whether you’re playing a standard DVD, 4k Blu-ray or 3D Blu-ray. 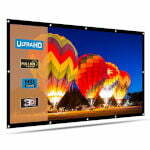 The 221 x 125cm viewing area is ideal for displaying media in the popular 16:9 format. This screen is designed to work equally well with front and rear projection. It’s easy to set up the OWLENZ mobile projection screen, thanks to the high-quality eyelets around the border. You can easily fasten the screen to a wall or frame using nails, hooks, double-sided tape and others. While designed for the home, you can easily attach this screen to a camper van when camping or to a garden wall. At a penny shy of £20, the OWLENZ 100 Inch Portable Projection Screen holds up against more expensive screens. 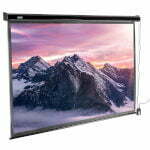 We like that it’s lightweight, easy to hang, and can handle front and rear projection. Plus the fabric feels tough enough to withstand wrinkles or creases, yet only weight 800 grams. The OWLENZ 100 Inch Portable Projection Screen scores 8/10. The LATIT 100 Inch Portable Projection Screen priced at £15.99 (from Amazon), uses a unique fabric. As a portable screen, it’s easy to fold and attach to a range of surfaces without creases or wrinkles. The high-quality milk fibre material is wrinkle-resistant. It naturally expands to remove any wrinkles within minutes. As it’s safe to iron, you can keep your screen in top condition. The milk fibre material also ensures that the effective resolution with maximum detail clarity when used with your 1080p and 4k projectors. With a wide 160-degree viewing angle, no matter where you’re sitting, the image will be clear with no degrading. Designed for both front and rear projection, the LATIT 100 Inch Portable Projection Screen is useful in a home cinema, the garden and in a camper van, amongst others. 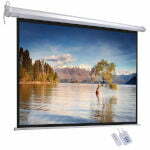 In our opinion, LATIT 100 Inch Portable Projection Screen is worth the price. It uses a unique fabric and comes with adhesive hooks. These make installation very easy. While LATIT hasn’t released the gain rating for this screen, it’s likely to be around 1.1 to 1.4, which is perfect for home use. We also like the wide viewing angle as more people can appreciate watching the movie. The milk fibre material feels slightly stretchy, which makes installing easier. Yet the screen’s firm enough not to be bent out of shape. Overall the LATIT scores 8/10. Only available at Amazon, the Elite Screens SB100WH2 is a 100-Inch 3D 4K/8K Ultra HD fixed frame screen. The price of £166.79 is admittedly quite steep, but let’s see what that buys us. Sitting behind the screen is a 2.7″ lightweight aluminium frame. Not only does this hold the screen in place, but it also makes it easy to attach it to a wall. On top of this frame is a triple layer PVC screen. The screen surface layer is finished in embossed CineWhite, which has a gain of 1.1. This provides a superior viewing experience across all media formats, including 4k Ultra HD and 3D. Surrounding the 49″ x 87″ viewing area is dense black velvet material, which is designed to absorb projector overshoot while increasing picture contrast for that perfect cinema experience. Elite Screens SB100WH2 has a 180° viewing angle, which ensures a superb experience, no matter where you sit. In terms of set up, it’s fairly straight forward. The tensioned rod and spring system easily adjusts. Plus the included the sliding wall brackets, drywall anchors, and screws, make light work of attaching the screen to a wall. 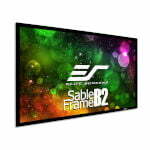 Finally, the Elite Screens SB100WH2 comes with 2 year manufactures warranty. The Elite Screens SB100WH2 sits at the top end of our list. But is it worth it? If you’re looking to upgrade from your first screen or aiming to invest in the best, then yes, it’s worth the £166.79. If you’re just starting on your home cinema journey or want a screen for a camper then it’s worth looking at others on the list. With that said, the only thing that lets this screen down is its assembly. You really need two of you and a large helping of patience! So be ready to experience some frustration. Lightweight and with multiple uses, the HENZIN 100 Inch HD 4K Portable Projection Screen is affordable at £17.99. Made from high-quality polyester material, the HENZIN screen should stay free of wrinkles and creases. If you’re removing it from the box or unpacking while travelling, it will look and perform the same. While other affordable screens are thin, the HENZIN is twice as thick. This depth improves the viewing experience greatly. As this screen allows front and rear projection, you can use in for a variety of applications. These include garden, camper, home cinema room and more. While we have no gain rating, the HENZIN portable projection screen is designed to accurately display 4K and 3D images in 16:9 format with ease. In terms of set up, 12 hooks and 12 stickers come with the screen. So it easy to attach it to a number of surfaces. With quite a mixed bag of reviews, we’re not quite sure what to make of the HENZIN 100 Inch HD 4K Portable Projection Screen. Yes, it’s cheap – £17.99 cheap. However, it does seem the company’s quality assurance lets the screen down. As undoubtedly the most expensive on our list, the QualGear QG-PS-FF6-169-100-W is for the serious home cinema enthusiast. So what does £231.09 (available at Amazon) buy you? Sitting behind the black velvet border is a lightweight Aluminum frame, which is complete with a centre bar. This ensures the screen remains tort and doesn’t wrinkle or sag. As a 100-inch 16:9 HDTV projector screen, the QualGear QG-PS-FF6-169-100-W features a high-quality ultra white soft PVC fabric. This fabric is easily washable and is both mildew and fire resistant. Holding it in place are fabric tensioners, which are adjustable. This home theatre screen has 1.1 gain with a viewing angle of 120 degrees. So allows for a superior viewing experience. The installation process is easy thanks to the installation manual and pre-sorted hardware. The QualGear QG-PS-FF6-169-100-W is unlikely to fit the budget of a first-time cinema. Also, it’s not portable. However, if you’re serious about buying the best then, this QualGear screen is worth every penny. This home theatre screen provides an excellent viewing experience and uses superior material, and so should last many years. We also like how easy it is to clean. This ReaseJoy projector screen is a little different than the others in our list so far and costs £63.95 from Amazon. The screen is made from two PVC layers. The front layer has a matte white finish with a black border, which increases the picture focus and contrast. The rear grey layer helps to diffuses projected light uniformly. While all the other screens so far have had an aspect ratio of 16:9, the ReaseJoy has a 4:3 aspect ratio. This screen, therefore, won’t work for everyone as 4:3 feels smaller. Also, it has a gain of 1.3. This home theatre screen sits in a metal case on a heavy duty roller. An electric motor allows silent operation and is controlled by a remote (battery not included). Setting the screen up is fairly easy. Simply mount the case on a wall, connect the mains and you’re good to go. There’s no need to built a frame or spent time attaching hooks. While other versions in the ReaseJoy use the standard 16:9 aspect ratio, this 100-inch screen uses 4:3. This might feel different considering nearly all LCD monitors display in 16:9. 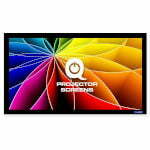 At £63.95, the ReaseJoy 100 inch Electric Motorized Projector Screen is great value. We would be quite happy to mount the ReaseJoy screen in front of our TV, allowing us to choose the best viewing experience. 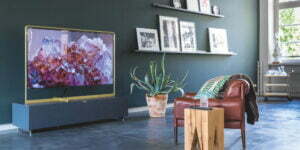 If you’re tight on space, then consider the VonHaus 100-Inch Electric Motorised Projector Screen. It’s available from Amazon at £79.99. As a motorised home theatre screen, the VonHaus is very simple to set-up. Simply mount the case, plug it in and grab the remote! You can easily mount the VonHaus on a wall or the ceiling. While you have to supply the hardware, full instructions are included. The screen has a gain factor of 1.1 and displays images in a 16:9 aspect ratio. The black border limits light overspill and so the picture quality is excellent. Once set-up, the remote makes light work of showing and hiding the screen. It’s idiot proof with controls for down, up and stop. If you can’t find the remote, then the power cable has the same controls. 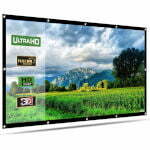 Finally, the VonHaus screen comes with a 2 Year Manufacturer Warranty. If you enjoy the occasional movie and want to take your viewing experience to the next level then for £79.99, the VonHaus 100 Inch Electric Motorised Projector Screen is worth it. The only thing that irritates us is that you have to supply the screws to install it. While quite annoying, it’s not a deal breaker. We like the remote and the motor, it’s smooth! Plus with a gain of 1.1, the screen produces a very clear, sharp image. As you can attach the VonHaus to the ceiling, it’s versatile and doesn’t need much space of its own. With its old school vibe, the Duronic Projector Screen MPS100/169 costs £69.99 (available from Amazon). While it doesn’t have a motorized element, it’s simple to set-up. Using the handle, you can easily unroll and roll up the screen. The exceptional matt white finish is both HD and 3D ready, and will faithfully reproduce sharp, clear images. The screen has a 16:9 aspect ratio and a gain of 1.0. 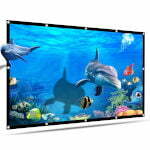 Duronic screens are thicker than many other standard projector screens on the market. This home theatre screen effortlessly rolls up inside the metal case. It’s easy to mount the unit on the wall or ceiling. 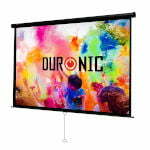 Putting to one side the pull-down element, the Duronic Manual Pull Down HD Projection Screen holds it’s own with the most expensive on the list. As the backing blocks out light, the images are crystal clear and bright. Overall, the viewing experience is excellent. Yes, it would benefit from a motor, which should be easy enough to add (and control using a home automation system). However, it’s a tiny issue. The only other thing to be aware of is the case size. it’s quite a bit larger than the screen. So ensure you have more than enough space. In our opinion, the Duronic screen is worth the £69.99 and scores: 8/10. There’s a superb choice of home theatre screens on the market. However, you’ll want to avoid the super cheap ones. If you’re just starting on your home cinema journey then, you’ll need to spend around £30 on a screen. Both the NIERBO and OWLENZ are fantastic not only for the price but for the image quality. Got more to spend? Buy the Duronic MPS100/169. It’s worth the £70. Ignore the pull-down element, unless you want to stick a TV behind it. It really holds it’s own against screens that are double the price. It’s of no surprise that our two most expensive home theatre screens (the QualGear and Elite Screens) are the best. Both are worth upgrading too and you’ll notice a difference straight away. What’s your favourite home theatre screen?